Near the town of Rhododendron, two bigleaf maple trees stand on each side of the replica tollgate that marks the westernmost and last tollgate operated on the Barlow Road—the branch of the Oregon Trail that crossed Mt Hood. The construction of this road and subsequent migration of thousands of emigrants over this path to the Willamette Valley and beyond is one of the most significant events in the history of our state. The original tollgate was in operation on this site from 1879 until 1915, and the tollgate maples are believed to have been planted in the 1880s by Daniel Parker, who was the tollgate keeper at that time. 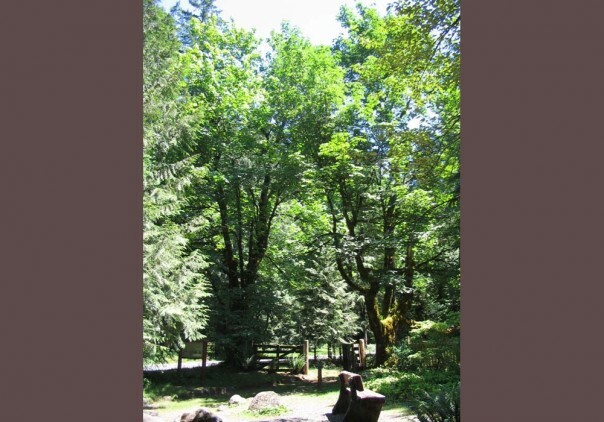 The Tollgate Maples were formally inducted into the Oregon Heritage Tree Program on April 4, 2007. The trees are located on federal land managed by the Zig Zag Ranger District of the Mt. Hood National Forest. To increase public awareness of the important contribution of trees to Oregon’s history and heritage, the Oregon Heritage Tree Program was established as the first state-sponsored heritage tree program in the nation. Oregon Heritage Trees are individual trees and groups of trees that have been designated as significant because of their importance in national, state or regional history. They stand as living memorials that connect us to our historical roots and carry a sense of the past into the future.